Dublin ( Irish: ) is the capital and largest city of Ireland. 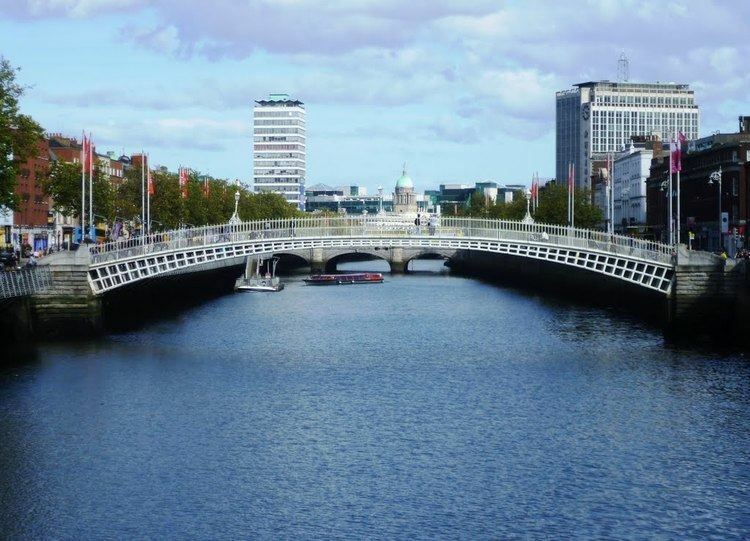 Dublin is in the province of Leinster on Irelands east coast, at the mouth of the River Liffey. The city has an urban area population of 1,110,627. Founded as a Viking settlement, the Kingdom of Dublin became Irelands principal city following the Norman invasion. The city expanded rapidly from the 17th century and was briefly the second largest city in the British Empire before the Act of Union in 1800. Following the partition of Ireland in 1922, Dublin became the capital of the Irish Free State, later renamed Ireland. Although the area of Dublin Bay has been inhabited by humans since prehistoric times, the writings of Ptolemy (the Greco-Roman astronomer and cartographer) in about 140 AD provide possibly the earliest reference to a settlement there. He called the settlement Eblana polis (Greek: ). Dublin celebrated its official millennium in 1988 AD, meaning that the Irish government recognised 988 AD as the year in which the city was settled and that this first settlement would later become the city of Dublin. 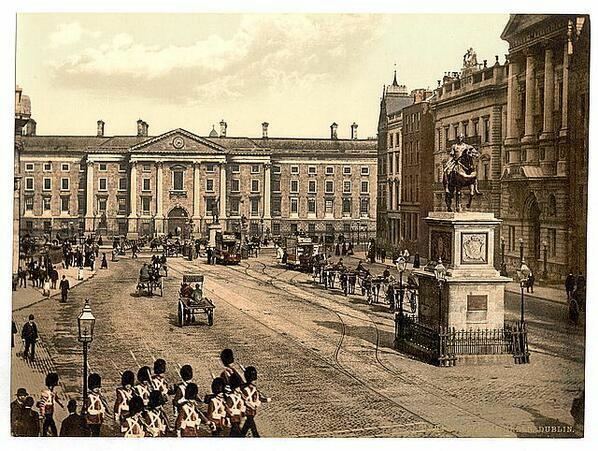 The name Dublin comes from Old Irish Dublind, early Classical Irish Dubhlind/Duibhlind, dubh /d?u?/, alt. /d?uw/, alt /d?u:/ meaning "black, dark", and lind /l?i?[d??] "pool", referring to a dark tidal pool where the River Poddle entered the Liffey on the site of the Castle Gardens at the rear of Dublin Castle). In Modern Irish the name is Duibhlinn, and Irish rhymes from Dublin County show that in Dublin Leinster Irish it was pronounced Duílinn /d??i:l?i?/. The original pronunciation is preserved in the names for the city in other languages such as Old English Difelin, Old Norse Dyflin, modern Icelandic Dyflinn and modern Manx Divlyn. Other localities in Ireland also bear the name Duibhlinn, variously anglicized as Devlin, Divlin and Difflin. Historically, scribes using the Gaelic script wrote bh with a dot over the b, rendering Du?linn or Dui?linn. Those without knowledge of Irish omitted the dot, spelling the name as Dublin. Variations on the name are also found in traditionally Gaelic-speaking areas (the Gàidhealtachd, cognate with Irish Gaeltacht) of Scotland, such as An Linne Dhubh ("the black pool"), which is part of Loch Linnhe. It is now thought that the Viking settlement was preceded by a Christian ecclesiastical settlement known as Duibhlinn, from which Dyflin took its name. Beginning in the 9th and 10th century, there were two settlements where the modern city stands. The Viking settlement of about 841 was known as Dyflin, from the Irish Duibhlinn, and a Gaelic settlement, Áth Cliath ("ford of hurdles") was further up river, at the present day Father Mathew Bridge (formerly Dublin Bridge) at the bottom of Church Street. , meaning "town of the hurdled ford", is the common name for the city in modern Irish. is a place name referring to a fording point of the River Liffey near Father Mathew Bridge. was an early Christian monastery, believed to have been in the area of Aungier Street, currently occupied by Whitefriar Street Carmelite Church. There are other towns of the same name, such as Àth Cliath in East Ayrshire, Scotland, which is Anglicised as Hurlford. The subsequent Scandinavian settlement centred on the River Poddle, a tributary of the Liffey in an area now known as Wood Quay. The Dubhlinn was a small lake used to moor ships; the Poddle connected the lake with the Liffey. This lake was covered during the early 18th century as the city grew. The Dubhlinn lay where the Castle Garden is now located, opposite the Chester Beatty Library in Dublin Castle. Táin Bó Cuailgne ("The Cattle Raid of Cooley") refers to Dublind rissa ratter Áth Cliath, meaning "Dublin, which is called Ath Cliath". Dublin is situated at the mouth of the River Liffey and encompasses a land area of approximately 44 sq mi, or 115 km2, in east-central Ireland. It is bordered by a low mountain range to the south and surrounded by flat farmland to the north and west. The Liffey divides the city in two between the Northside and the Southside. Each of these is further divided by two lesser rivers – the River Tolka running southeast into Dubin Bay, and the River Dodder running northeast to the mouth of the Liffey. Two further water bodies – the Grand Canal on the southside and the Royal Canal on the northside – ring the inner city on their way from the west and the River Shannon. The River Liffey bends at Leixlip from a northeasterly route to a predominantly eastward direction, and this point also marks the transition to urban development from more agricultural land usage. The Dublin region is the economic centre of Ireland, and was at the forefront of the countrys rapid economic expansion during the Celtic Tiger period. In 2009, Dublin was listed as the fourth richest city in the world by purchasing power and 10th richest by personal income. According to Mercers 2011 Worldwide Cost of Living Survey, Dublin is the 13th most expensive city in the European Union (down from 10th in 2010) and the 58th most expensive place to live in the world (down from 42nd in 2010). As of 2005, approximately 800,000 people were employed in the Greater Dublin Area, of whom around 600,000 were employed in the services sector and 200,000 in the industrial sector. 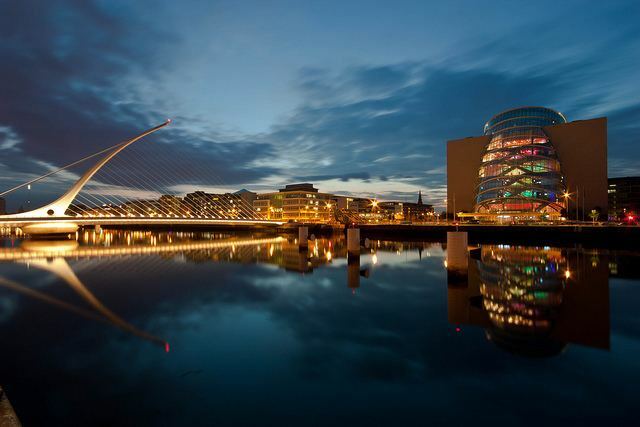 Dublin has a world-famous literary history, having produced many prominent literary figures, including Nobel laureates William Butler Yeats, George Bernard Shaw and Samuel Beckett. Other influential writers and playwrights include Oscar Wilde, Jonathan Swift and the creator of Dracula, Bram Stoker. It is arguably most famous as the location of the greatest works of James Joyce, including Ulysses, which is set in Dublin and full of topical detail. Dubliners is a collection of short stories by Joyce about incidents and typical characters of the city during the early 20th century. Other renowned writers include J. M. Synge, Seán OCasey, Brendan Behan, Maeve Binchy, and Roddy Doyle. Irelands biggest libraries and literary museums are found in Dublin, including the National Print Museum of Ireland and National Library of Ireland. In July 2010, Dublin was named as a UNESCO City of Literature, joining Edinburgh, Melbourne and Iowa City with the permanent title. There are several theatres within the city centre, and various world famous actors have emerged from the Dublin theatrical scene, including Noel Purcell, Sir Michael Gambon, Brendan Gleeson, Stephen Rea, Colin Farrell, Colm Meaney and Gabriel Byrne. The best known theatres include the Gaiety, Abbey, Olympia, Gate, and Grand Canal. The Gaiety specialises in musical and operatic productions, and is popular for opening its doors after the evening theatre production to host a variety of live music, dancing, and films. The Abbey was founded in 1904 by a group that included Yeats with the aim of promoting indigenous literary talent. It went on to provide a breakthrough for some of the citys most famous writers, such as Synge, Yeats himself and George Bernard Shaw. The Gate was founded in 1928 to promote European and American Avant Garde works. The Grand Canal Theatre is a new 2,111 capacity theatre which opened in March 2010 in the Grand Canal Dock. 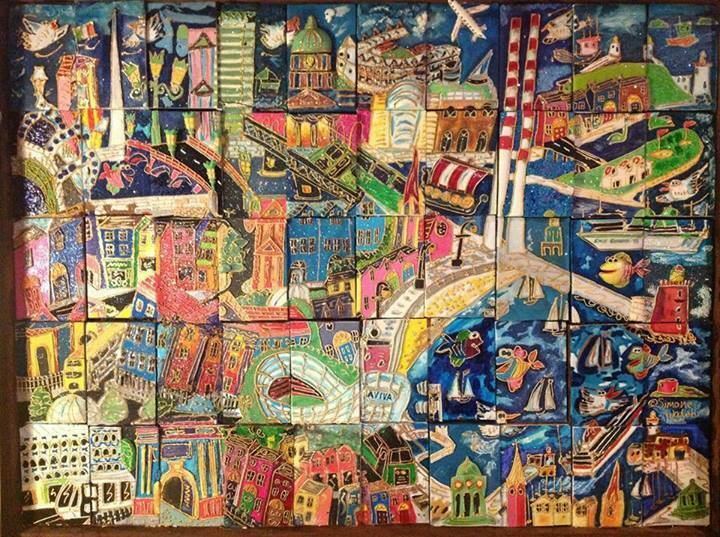 Apart from being the focus of the countrys literature and theatre, Dublin is also the focal point for much of Irish art and the Irish artistic scene. The Book of Kells, a world-famous manuscript produced by Celtic Monks in AD 800 and an example of Insular art, is on display in Trinity College. The Chester Beatty Library houses the famous collection of manuscripts, miniature paintings, prints, drawings, rare books and decorative arts assembled by American mining millionaire (and honorary Irish citizen) Sir Alfred Chester Beatty (1875–1968). The collections date from 2700 BC onwards and are drawn from Asia, the Middle East, North Africa and Europe. In addition public art galleries are found across the city, including the Irish Museum of Modern Art, the National Gallery, the Hugh Lane Municipal Gallery, the Douglas Hyde Gallery, the Project Arts Centre and the Royal Hibernian Academy. In recent years Dublin has become host to a thriving contemporary art scene. Some of the leading private galleries include Green on Red Gallery, Kerlin Gallery, Kevin Kavangh Gallery and Mothers Tankstation, each of which focuses on facilitating innovative, challenging and engaging contemporary visual art practice. Three branches of the National Museum of Ireland are located in Dublin: Archaeology in Kildare Street, Decorative Arts and History in Collins Barracks and Natural History in Merrion Street. The same area is also home to many smaller museums such as Number 29 on Fitzwilliam Street and the Little Museum of Dublin on St. Stephens Green. Dublin is home to the National College of Art and Design, which dates from 1746, and Dublin Institute of Design, founded in 1991. Dublin has long been a city with a strong underground arts scene. Temple Bar was the home of many artists in the 1980s, and spaces such as the Project Arts Centre were hubs for collectives and new exhibitions. The Guardian noted that Dublins independent and underground arts flourished during the economic recession of 2010. Dublin also has many acclaimed dramatic, musical and operatic companies, including Festival Productions, Lyric Opera Productions, the Pioneers Musical & Dramatic Society, the Glasnevin Musical Society, Second Age Theatre Company, Opera Theatre Company and Opera Ireland. Ireland is well known for its love of baroque music, which is highly acclaimed at Trinity College. Dublin was shortlisted to be World Design Capital 2014. Taoiseach Enda Kenny was quoted to say that Dublin "would be an ideal candidate to host the World Design Capital in 2014".